Click on a topic below to read more! Are there private rooms available? The majority of our rooms are private. To request a private or semi-private room talk with the Admissions Nurse. Laundry is included in the room rate but some individuals prefer that their family take their laundry home to wash it. If Pleasant View does the laundry you should bring in about seven day’s worth of clothing so that there are enough outfits to wear while other clothes are being cleaned. If family does the laundry, you only need to bring in enough clothing for as often as the family is going to launder it. Bring clothing that is going to be comfortable for you to wear during your stay. We do provide hospital gowns at night time if you desire. When do I get to discharge? Discharge is determined by therapy, your primary care physician, and nursing staff. The Nurse Care Coordinator, social services, and therapy will assist you with your discharge. Discharges are to be completed before noon on the expected day of discharge. May I go out with my family while I am there? If you are an individual on Medicare A you may not go out with your family except for special occasions with a physician’s order because Medicare feels that if you are able to be out in the community that you do not need to be at a skilled nursing facility. If you are admitted and are not under Medicare A you may go out on community pass with a doctors order and you must let our staff know ahead of time so that arrangements can be made for medications etc. Will I be able to get my hair done while I am at Pleasant View? The staff are able to wash your hair on your bath day on the unit. We also have a beauty shop, Style Quest Salon, located on the Lower Level. The Salon beautician comes in three times a week to provide hair care services for both women and men. She can provide shampoo and set, haircuts, perms, etc. at an additional charge. A trust account needs to be set up at the main business office to pay for the hair care services. What type of personal items and accessories do I need to bring? PV has a limited number of TVs, recliners, and lift chairs in the rooms. You are welcome to bring in your own preferred items as well. Recliner/Lift Chair – You will be responsible for removal on the day of discharge. How much therapy will I receive? Therapy is individualized. Therapy will determine how many times a day, length of therapy sessions, and how many times per week dependent upon their assessment. What documents should I bring with me? Upon admission or prior to admission you need to bring in your Medicare card or replacement insurance card, supplemental insurance card, drug plan card or part D pharmacy card, and social security card so that they can be copied. You will also need to bring in your HCPOA, and DPOA papers to have copied. If it applies we also need to have guardianship and incapacity papers. Do I need to bring my medications in from home? 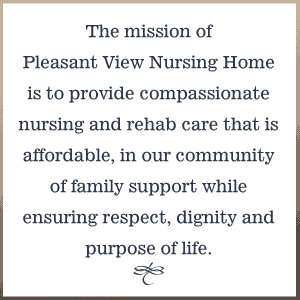 No, while you are at Pleasant View we will receive your medications from our pharmacy and when you are discharged we will send a list of your current medications to your pharmacy to be filled.